California Governor Jerry Brown declared a state of emergency as a trio of severe storms pounded the state with flash floods, mudslides and raging rivers. At least four people died as a result. 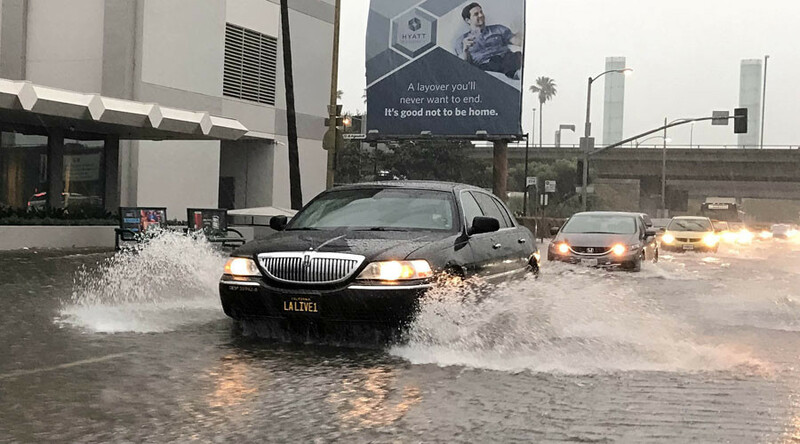 Flood watches and warnings were in effect in Southern California as downtown Los Angeles received nearly 4 inches of rain, inundating roadways, toppling trees and raising fears of damaging mudslides. A couple living in Seal Beach, south of Los Angeles were at home when the rain began to fall. They watched as water began to fill the mobile home community, and water crept over the step leading up to their home. Gov. Brown declared a State of Emergency on Monday to secure funding to help communities respond to and recover from severe winter storms that caused flooding, mudslides, erosion, debris flow and damage to roads and highways. Flooded highways were seen in Long Beach and the Pacifica Coast Highway, a major artery between Los Angeles and California coastal towns. The AP reported four people had died and three were missing, while others were rescued from raging floodwaters. Among the dead was an 18-year-old woman in Alameda County southeast of San Francisco whose car plunged into the rushing waterway after a collision late Saturday. Two other people remained missing after being reported in in waters off Pebble Beach on Saturday, and search party crews were called off. In Los Angeles receding stormwaters revealed a body in a park in Harbor City. There are no more details on three others missing. Tweet after tweet showed flood waters in this once dry state that had suffered from over a decade of drought. “#Malibu Canyon Rd now open after #LARain-related closure,” tweeted LA County Public Works. In Topanga Canyon, “Studying stability of slopes/removing rock+mudslides Hwy27,” tweeted the California Transportation Authority. Other Southern Californians used the floods for fun, paddleboarding. Even using the running track as a swimming pool.